On a cold March night in Seoul almost 600 years ago, Korean astrologers spotted a bright new star in the tail of the constellation Scorpius. It was seen for just 14 days before fading from view. From these ancient records, modern astronomers determined that what the Royal Imperial Astrologers saw was a nova explosion, but they had been unable to find the binary star system that caused it—until now. A new study published today by the journal Nature pinpoints the location of the old nova, which now undergoes smaller-scale "dwarf nova" eruptions. The work supports that idea that novae go through a very long-term life cycle after erupting, fading to obscurity for thousands of years, and then building back up to become full-fledged novae once more. "This is the first nova that's ever been recovered with certainty based on the Chinese, Korean, and Japanese records of almost 2,500 years," said the study's lead author Michael Shara, a curator in the American Museum of Natural History's Department of Astrophysics. A nova is a colossal hydrogen bomb produced in a binary system where a star like our Sun is being cannibalized by a white dwarf—a dead star. It takes about 100,000 years for the white dwarf to build up a critical layer of hydrogen that it steals from the sun-like star, and when it does, it blows the envelope off, producing a burst of light that makes the star up to 300,000 times brighter than the sun for anywhere from a few days to a few months. For years, Shara has tried to pinpoint the location of the binary star that produced the nova eruption in 1437, along with Durham University's Richard Stephenson, a historian of ancient Asian astronomical records, and Liverpool John Moores University astrophysicist Mike Bode. Recently, they expanded the search field and found the ejected shell of the classical nova. They confirmed the finding with another kind of historical record: a photographic plate from 1923 taken at the Harvard Observatory station in Peru and now available online as part of the Digitizing a Sky Century at Harvard (DASCH) project. "With this plate, we could figure out how much the star has moved in the century since the photo was taken," Shara said. "Then we traced it back six centuries, and bingo, there it was, right at the center of our shell. That's the clock, that's what convinced us that it had to be right." Other DASCH plates from the 1940s helped reveal that the system is now a dwarf nova, indicating that so-called "cataclysmic binaries"—novae, novae-like variables, and dwarf novae—are one and the same, not separate entities as has been previously suggested. After an eruption, a nova becomes "nova-like," then a dwarf nova, and then, after a possible hibernation, comes back to being nova-like, and then a nova, and does it over and over again, up to 100,000 times over billions of years. "In the same way that an egg, a caterpillar, a pupa, and a butterfly are all life stages of the same organism, we now have strong support for the idea that these binaries are all the same thing seen in different phases of their lives," Shara said. "The real challenge in understanding the evolution of these systems is that unlike watching the egg transform into the eventual butterfly, which can happen in just a month, the lifecycle of a nova is hundreds of thousands of years. We simply haven't been around long enough to see a single complete cycle. 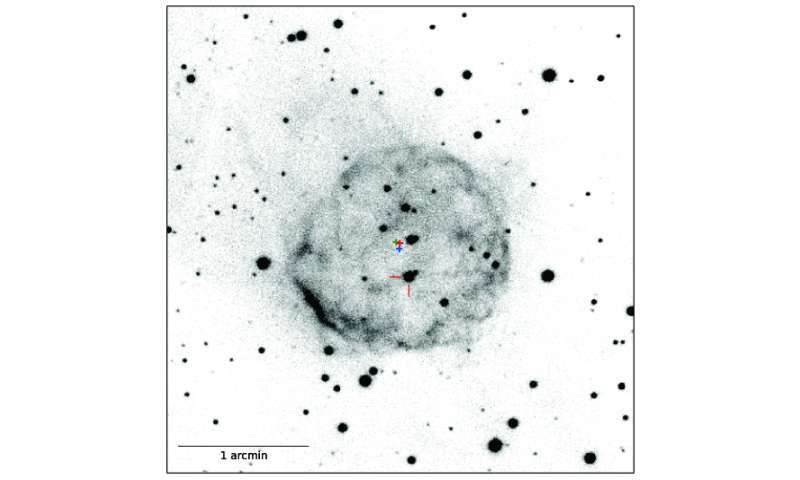 The breakthrough was being able to reconcile the 580-year-old Korean recording of this event to the dwarf nova and nova shell that we see in the sky today." This study was based on observations from the Southern African Large Telescope (SALT), and the Las Campanas Observatories' Swope and Dupont telescopes. You would not want to be a resident of a planet orbiting THAT star. If I had access to italic fonts here, then I would not have to use capitals for emphasis. If there is life on worlds orbiting either or both of those binary members, being semi evolved cells under deep ground or seas would be a must.